There’s no denying it anymore, the watchmakers at MB&F must be obsessed with science fiction. 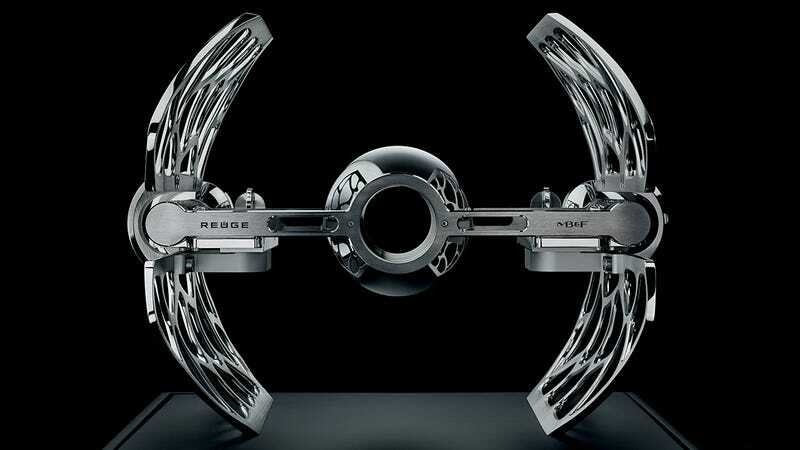 That explains why the company’s last few timepieces looked like Deep Space Nine and a robot, and why its new music box is shaped like a TIE fighter, and plays the Star Wars theme. At just north of $18,400+, Maximilian Büsser and Reuge’s MusicMachine 3 unfortunately isn’t in the budget for every Star Wars fan. But since only 99 pieces are being produced in three different finishes, the odds of the average collector getting their hands on one were already pretty slim. So what makes this music box so expensive? Mostly craftsmanship and an impeccable attention to detail. On either side you’ll find an over-sized roller dotted with over 1,400 tiny pins that have each been placed by hand in an equal number of impossibly small drill holes. And together with a precision-tuned 72-tooth comb (made of a special steel alloy) the two rollers can play six distinct tunes including the themes from Star Wars, James Bond, Mission Impossible, The Godfather, Merry Christmas, Mr. Lawrence, and The Persuaders. Does anyone actually need an $18,400+ music box? Probably not. But it’s hard not to stare at this beautiful creation, so imagine having an actual one at your desk. Would you ever get any work done ever again?